Leica makes a slender, celestially bright Ultravid HD. Because of its superb optical resolution and contrast, the Ultravid belongs in any list of the top binoculars of the world. Look through a Leica Ultravid, and you're immediately struck with how bright and clear the image is from the center of the generous field of view to the outer edges, and how true and free from bias are the colors. 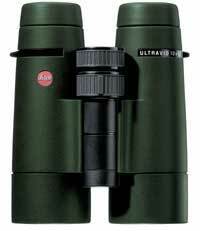 With magnesium housing and a titanium central hinge shaft, this binocular is strong and rugged as well as lightweight. The distinctive, precise diopter adjustment on the central column makes it easy to check the setting at a glance. The diopter can also be easily found by feel, but it locks and won't get accidentally knocked off its setting. Leica offers all the Ultravid models with a pleasing-to-the-hand, non-slip, bump-resistant black covering. The Ultravid comes in 8x42, 10x42, 10x50, 8x32, 10x32, 7x42, and 8x50. We tested the 8x42 and 10x42 for this review.